Where To Find COOKIE SHOTS in Disneyland!!!! Halloween Time is in full glory at Disneyland Resort, including at the Grand Californian Hotel! We already told you about the treat table in the lobby of the hotel, which is full of cookies and other spoooooooky goodies. 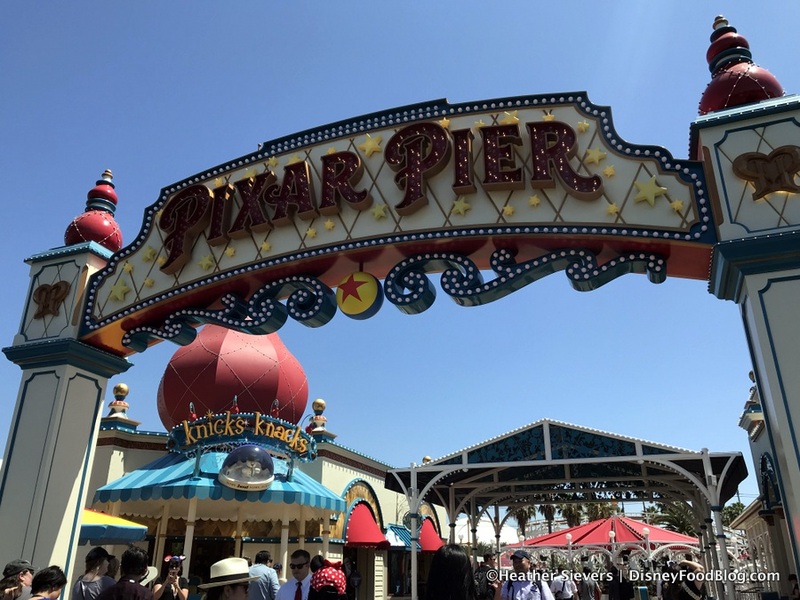 The fun hasn’t stopped on Pixar Pier! Disney California Adventure’s newest Land in Disneyland Resort celebrates the fun and friendship represented by the films of Pixar. We’ve had a blast covering every inch of Pixar Pier, and we’ve already brought you our full review of Lamplight Lounge. Today, we travel up the elegant stairway to the pinnacle of fine dining at Walt Disney World, Victoria & Albert’s at the Grand Floridian Resort and Spa. Join me for an unparalleled experience as I take you behind the opulence to the excitement and camaraderie of the Chef’s Table! And let me tell you… it’s AWESOME!! Victoria and Albert’s is the crown jewel in Disney’s culinary offerings. And while it is certainly expensive (that might be an understatement), I aim to show you that for the true food lover, the Chef’s Table experience is worth every penny. 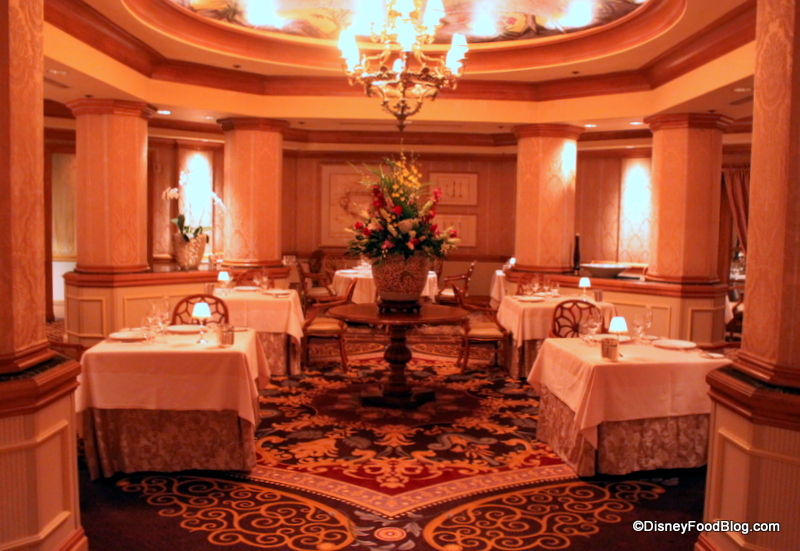 By the way, if you read through this review and decide the Chef’s Table is not for you, you can also dine in the Dining Room to the more intimate Queen Victoria Room. 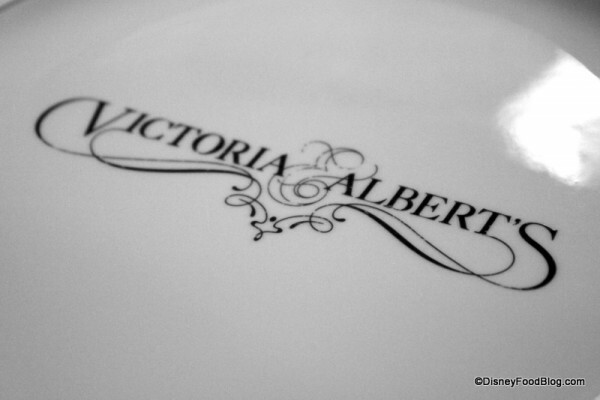 Reservations for Victoria and Albert’s go quickly. It is recommended that you book as close to 180 days out as possible. 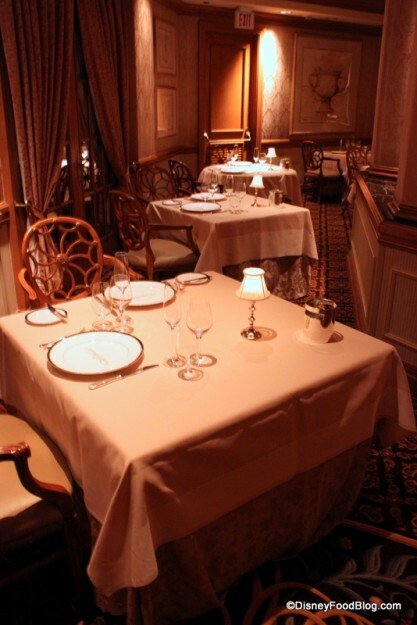 As for cost, the menu is prix fixe, meaning that you pay a set price for the meal. Expect your meal to begin at $135 per person for the Dining Room, with an additional charge of $65 for wine pairings. That price includes six courses. Queen Victoria’s Room and the Chef’s Table menus may include up to thirteen courses, and prices start at $210/person for dinner and $105 for wine pairings. Keep in mind that these prices do not reflect tax or gratuity, so be prepared. While Queen Victoria’s Room offers the height of elegant dining, the Chef’s Table provides interested guests full access to the restaurant’s culinary team in a meal that is as much performance as it is sustenance. Once you check in for your reservation at the Chef’s Table, you are escorted through the well appointed (and very quiet!) main dining room. You’ll notice low light, beautiful fresh flowers, and the strains of harp music. The whole effect is quite romantic and very formal. There is a strict dress code here, and men must wear jackets. The Dining Room consists of a mere fourteen tables, beautifully set with spotless crystal and china. Very chi chi. We followed the debonaire Maître d’hôtel, Israel Perez, through this space and into the brightly lit kitchen. At that time, we were informed that Chef de Cuisine Scott Hunnel would not be joining us because of a conflicting event. In his place, Sous Chef Aimée Rivera would guide us through our meal. Both Mr. Perez and Chef Rivera were phenomenal, and it’s clear that their passion and driving force is the comfort and enjoyment of their guests. 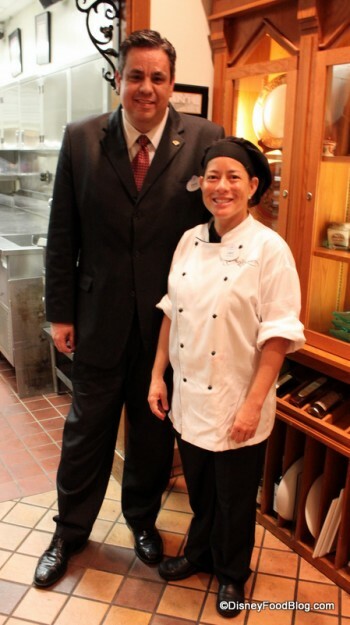 Chef Rivera invited us to interact at will with the kitchen staff, and suggested that we voice any and all questions that we might have (Mua ha ha ha!!! She didn’t know just how annoying I can be!). Update: Disney is no longer offering Divvies. 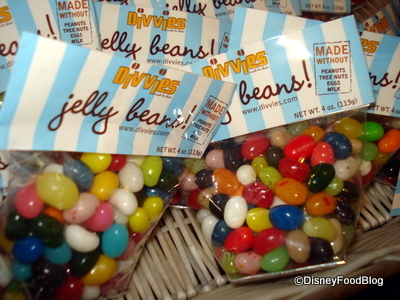 They are currently offering bakery items from the Enjoy Life and OMG Manufacturers along with Rocky Mountain Popcorn, and Surf Sweets Jelly Beans throughout the Parks and Resorts. Just came across this display of specialty diet items in the Main Street Bakery today! It’s new to me, so I thought I’d share. For more great info and resources for dining gluten-free in Disney World and Disneyland, check out our Gluten-Free Resources pages! The first thing to catch my eye was the caramel popcorn! It looked deeeeelicious! 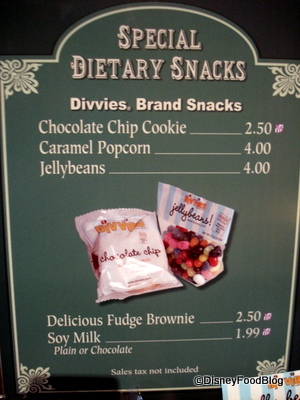 All of these products seem to be from the same brands — French Meadow Bakery and Divvies. Has anyone sampled these brands? How are they? Any preference?